Scooper - Technology News: Is “Purpose” just another buzzword for our workplace? Purpose, an organization’s aspirational reason for being beyond profits, is creating an impact on hiring, retaining talent and an organization’s bottom line. However, Purpose has a triple meaning in the workplace – the way the workplace is organizing to inspire their employees, the identification and empowerment of purpose-oriented workers, and the integration of purpose into brands. The organizations that unite around these types of purpose and include it in their hiring, retention and organizational strategies will be the winners and future leaders of tomorrow. ● 60% of millennials believe that a sense of purpose is part of the reason they chose to work at their current employer ● 90% want to use their skills to create positive social impact ● 87% millennials believe that the success of a business should be measured in terms of more than just financial performance ● In the Global Shapers Annual Survey 2015, six in ten millennials indicated that an opportunity to “make a difference in society, my city, or my country” is the top factor they look for in a job. 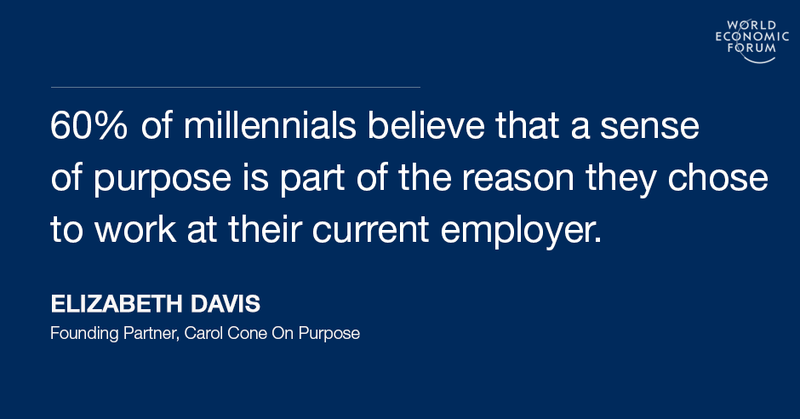 And yet, a purposeful workplace goes beyond the millennial generation. According to Imperative’s Workforce Purpose Index, there are 42 million purpose-driven workers in the United States alone, with women and people over 55 being the most likely to be Purpose-Oriented Workers. Imperative defines a purpose-oriented worker as one with a psychological predisposition to see work as primarily about purpose – personal fulfillment and helping other people. These purpose-oriented workers are dramatically changing our workforce. Employees no longer want a 9-5 job, they want to help others and have an impact. These employees that identify as purpose-driven workers have 20% longer expected tenures, are 50% more likely to be in leadership positions, 47% more likely to be promoters of their employers and have 64% higher levels of fulfillment in their work. Attracting this type of talent helps companies build a workforce that stays longer and exponentially increases growth. There’s also a third, and perhaps most impactful kind of purpose. Organizations like Unilever, IKEA and Starbucks build purpose into their brands, and are seeing the impact it has on employee longevity and the bottom line. Unilever recently announced that their brands who have adopted goals from their Sustainable Living Plan, such as Lifebuoy and Dove, grew 30% faster than those who did not embrace purpose, and delivered almost 50% of the company’s growth.3 Unilever, because of their purpose to make sustainable living commonplace that is embedded into company’s operations, personal KPI’s, supply chain and key brands, is currently the #1 employer in 34 of their global markets. So how can you embrace the many types of purpose to attract the best talent, inspire innovation and collaboration and ignite profitability and growth? Purpose is not just another buzzword. It is here to stay. Think, what will the world be like in 15 years if purpose products and jobs become the most sought after in the world?